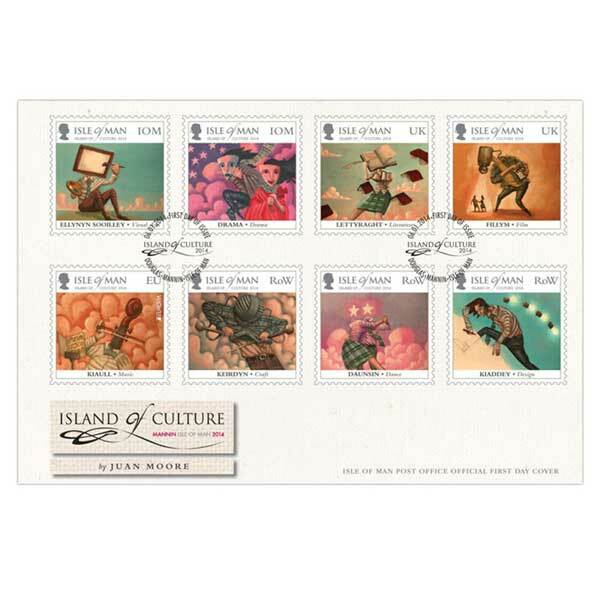 As the unique and remarkable cultural life of the Isle of Man is recognised by the 2014 Island of Culture events, The Isle of Man Post Office showcase the work of Manx artist Juan Moore in this stunning new stamp issue. Island of Culture 2014 is a year of unique events showcasing the surprisingly abundant cultural scene in the Isle of Man, from paint and poems to popular music and movie theatre. For collectors, supporters of the fine arts or anybody associated with the Island of Culture, this issue is a remarkable memento as well as a very collectable demonstration of the artistic skill the Island is so abundant in. The stamp issue - which has been assisted by Island of Culture customers Mark Kermode, the appreciated movie critic, and Clare Religious, President of Tynwald - is available in sets and sheets, in mint and Cancelled to Order (postmarked), a First Day Cover, an envelope providing all the stamps postmarked with the initial day of issue, and a Presentation Pack, that includes not just the stamps in mint condition, but additionally a four-sided folder featuring more images and details concerning the Island of Culture and these artworks. Excellent service. Easy ordering, and rapid delivery. Well recommended.